We are a family run plumbing and heating company, based in Bognor Regis, covering the South Coast. We have been trading since 2002, but have been in the plumbing and heating trade for over 22 years. We tackle all aspects of plumbing and heating works; from drippy taps to full heating and hot water installations. We are fully trained and insured and able to take on all kinds of plumbing, heating and gas installations, services and repairs. We have a fully employed team of highly skilled plumbing & heating engineers dotted along the South Coast. Delaney Plumbing are always growing and adapting our services to support our customers. We are big enough to support you and small enough to care. Here at Delaney Plumbing we cover all types of plumbing, heating and gas works but we specialise in boiler installations. We have a team of fully employed plumbing, heating and gas engineers who are fully qualified and insured in the plumbing, heating and gas industry, we also don’t use sub contractors like a lot of local firms do. Our team work under strict instruction and guidance to make sure they carry out the job in hand to the highest standard and to leave the customer happy and keen to recommend us to a friend or family member. We also have highly trained office staff who are on the other end of the phone 6 days a week to help out with any problem you may have. We use the latest technology to track every job, so to bring up a customer history at a touch of a button makes the whole service more efficient. We offer an emergency call out service 7 days a week so all our customer know they are in safe hands and can get us when every they need to. We support local hotels, letting agents, building contractors, nursing and care homes with their plumbing, heating and gas needs, they trust us to get the job done quickly and efficiently. Here at Delaney Plumbing we’re great believers of training from within so we started to use the apprentice scheme over two years ago now, and haven’t looked back. 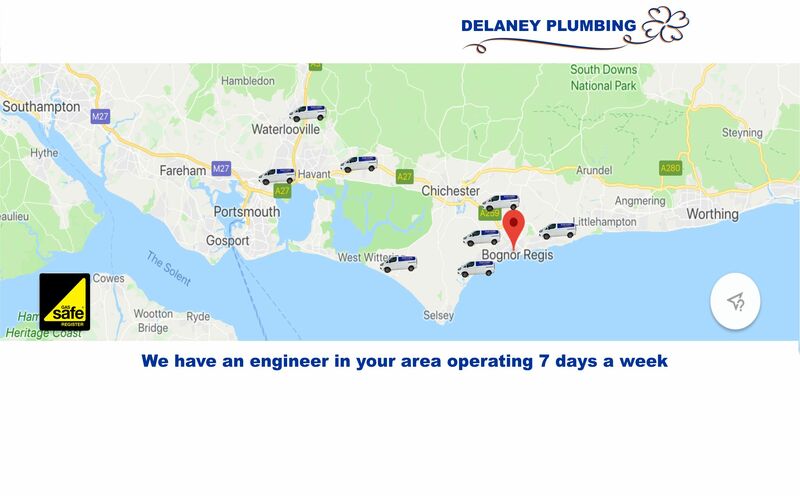 Our young apprentices are our future and we believe Delaney Plumbing can give young inspiring plumbing & heating students a head start in the industry, giving them good quality on site training from a supporting business which works very closely with Chichester college and Steve Willis training centre. Delaney Plumbing also put our qualified engineers through further training to help them carry out the works to the highest standard. Plumbing can be straight forward, or very challenging. Either way we find it extremely rewarding. It’s not just fitting an appliance or fixing a leaky tap, it’s about problem solving, knowing your products and understanding and sticking to regulations. Seeing a difficult issue as a challenge to overcome, not a problem to avoid! Customer satisfaction is our main goal, we want to be referred by you, to your colleagues, friends and family. Job satisfaction being a plumber is second to none. Customers are usually treating themselves to something that will function properly or just look fantastic and it’s a joy to see their faces when the finished results matches their expectations. The satisfaction is the same whether it’s a dripping tap that’s been fixed or underfloor heating that’s been installed. We can work with other companies to make your life easier. Do you want a full kitchen or bathroom refit? We work together with painter/decorators, tilers and carpenters and can arrange the separate quotes to complete any task no matter how big.